Are Video Games Bad for Kids? That is a question that looms over me pretty much all the time. It’s that question that causes a major sense of tension at our house. The main reason for the tension is that I am totally unclear about my feelings on the subject. Sometimes I feel like video games are a good way to relax and have fun. Sometimes I worry that my kids are quickly becoming addicted. Sometimes I even get excited about the learning potential. This sense of uncertainty makes it very difficult for me to stay consistent with any type of rules surrounding video games. I end up frustrated, uneasy and overwhelmed. but I’m too frustrated, uneasy and overwhelmed to take advantage of their excitement. Well I think I’ve found the answer! Or at least I’ve found the beginnings to an answer. A way to start forming real ideas and feelings about video games based on facts. I’ve just finished reading it (and taking lots of notes). It’s a fast read and includes a lot of great researched information. 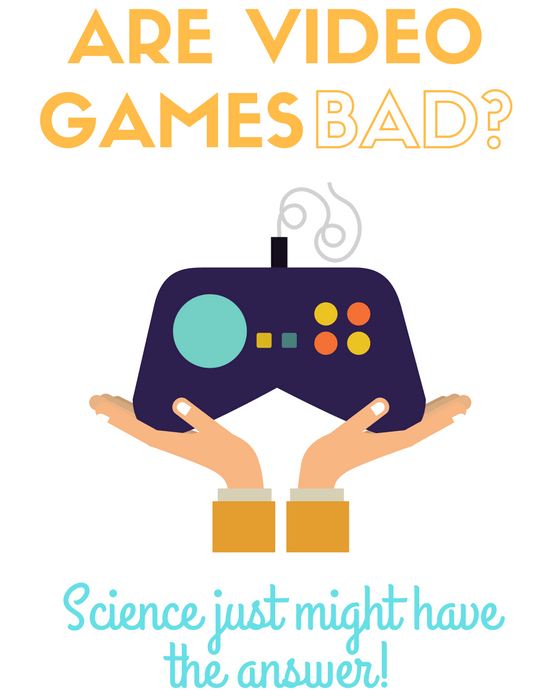 Video game facts… based on scientific research. Dr. Rachel Kowert (author of A Parent’s Guide to Video Games) not only sent me a copy of her book, she also offered to do a Q & A with us! I collected your questions and she answered them! Do you worry that video games are bad for kids? Are there questions that hold you back from creating a real family plan for video games? This will definitely get you on the right track! 1. How can I have games in my house without them becoming an addiction? A lot of parents are concerned about their child’s love for video games turning into an addiction. Anything in excess is bad for you and video games are no exception. The good news here is that a true behavioral addiction to video games is extraordinarily rare. In fact, some recent research out of Germany has proposed a prevalence rate of only 0.02% of the video game playing population. A lot of parents also tend to confuse excessive playing with addictive playing. It is not considered an addiction until their video game play starts causing problems in every aspect of their life (educationally, occupationally, socially, psychologically, etc.) and over a prolonged period of time. 2. Are some games more addictive than others? There is no evidence to suggest that any specific type of video game is more likely to promote an addiction than any other type of video game. 3. Are boys more likely than girls to get addicted? I am not aware of any research that has indicated large gender differences in the prevalence rates of video game addiction. If this is the case, it would likely be due to the fact that boys remain more likely to play video games than females (though not by much!). 4. How much time spent on games would constitute as addiction? There is no magic number in terms of “if you play X number of hours, you are addicted”. A few years ago, the American Psychiatric Association (APA) put out a call for more research in the field of video game addiction (or Internet Gaming Disorder as it is referred to by the APA) in order to determine what the exact signs of a behavioral addiction to video games might look like. Several potential diagnostic criteria have been proposed by researchers in the field, but no standard guidelines have yet to be set. For example, Dr. Mark Griffiths (Nottingham Trent University) suggests that players show signs of salience (video game play dominates the player’s thoughts, emotions and behaviors), mood modification (video games cause a change in the players mood, such as euphoria), conflict (the player suffers negative consequences due to play), tolerance (the player needs to play longer to achieve the same mood modifying effects), withdrawal (the player is frustrated and irritable if they cannot play) and relapse (the player is unable to control their behavior), over a period of three to six months. 5. How do video games affect their ability to focus on life events and reality? As with any leisure activity, video games can provide a nice distraction from day-to-day life. However, video games can also provide a shared activity for friends and family to enjoy together. In this sense, video games are just like any other leisure activity (team sports, board games, bike riding, etc.). 6. What long term affects do video games have on kids socially and emotionally? Broadly speaking, the research has found that video games have more positive social effects than negative social effects for children. For example, video games provide an easily accessible and relatively affordable shared activity for friends to enjoy together. This is particularly the case for children who may be shy and have difficulties initiating conversations with others, as video games are able to provide a perpetual topic of conversation. 7. Can video games lead to violence or other social issues? This is the question I get most often and is also the topic that is most sensationalized in the media! Short answer: no. There is no evidence that playing violent video games makes someone more likely to commit violent acts or violent crime. The research with aggression is a little more nuanced. There is no evidence of long term changes in aggression, but some research has concluded that playing violent video games may contribute to small, short term increases in aggressive thoughts. 8. Can video games harm children who may be ADD or OCD? As video games are often fast-paced, there have been some concern as to whether playing these kinds of games may aggravate the attention problems associated with ADD. Contrary to these claims, video games have actually emerged as promising tools to help improve attention and reduce impulsivity for individuals who show symptoms of ADD. That said, more research is needed before video game play can be recommended as part of a treatment plan.I don’t know of any scientific research linking it video game play to a worsening of OCD symptoms. 9. How do they effect brain development? Video games have been found to have many positive cognitive effects for children. For instance, video games can provide a great avenue for learning new skills (such as problem solving) as well as new information (such as world history). 10. How much time should kids be allowed to play video games? Everything in moderation! I really want parents to know that it is not all doom and gloom when it comes to video games. In fact, I would argue there is more good than bad! Video games are great vehicles for learning, they are highly social spaces, and they provide an arena for children to experiment with new roles and ideas. I want parents to be empowered by the science behind the headlines and more confident in making media choices for their families and part of that is allowing your children the freedom to play – and playing with them! Of course, this doesn’t mean all day every day but the same could be said for any other activity your child may enjoy (watching television, listening to music, playing sports, etc.). 11. Do you have tips for finding balance and moderation? My advice for parents when approaching video games (and any kind of media for that matter) in our family lives: we should be intentional, be present, and have fun. By intentional I mean be aware of the content in the games that you are bringing into your home for your children. This isn’t just about age ratings but also the content itself. The ESRB is responsible here in America for providing age ratings and placards describing any explicit content. So if you don’t want your children playing games with suggestive themes or explicit language, you need to pay attention to the content descriptors alongside the age ratings. In terms of being present – I hear parents say a lot to me “I don’t know what they are playing, I hear guns, I think its violent, is it bad for them”. While being intentional will help with this, you can also be present by talking to your children about the games they play. Ask them what games they like? Also, being present in terms of playing the games with them. Now I understand not every parent wants to play video games – and if you are the parent of a teenager they probably don’t want you to play with them – but you can sit in the same room while they play. Not only will this give you a first hand look at what kinds of games they are playing but also will give you some time to spend with your child. Even if they are “distracted” by playing the game, they will know you are making an effort to sort of get involved in what interests them and you may be surprised at how they might open up to you and talk about other things just because you are there in the room with them. I very clearly remember my mom sitting and watching my brother and I play Super Mario brothers. Sometimes she would play – and ALWAYS die on what she called “The first mushroom” – but other times she would just sit in the room with us and watch us for a bit and it was wonderful to have her there and feel like she was taking an interest in what we were doing and being engaged with the game and us. And lastly, have fun! Games are supposed to be fun after all. And like I mentioned before, if you don’t like video games, you can definitely use them as a jumping off point for other activities that your whole family might enjoy. For instance, if your child likes sports games, maybe that means they would also enjoy going to a sporting event. Or if they like fantasy-type games – like World of Warcraft – maybe they’d like to go to Blizzcon. Maybe that is something you could do as a family? Or maybe you could help them make a costume for it. I have to say, I’m pleasantly surprised with this article! I’m a stay at home mom by day, video gamer by night, so when I see articles with this kind of title, I automatically assume it will be one that vilify video games. I’m more in the know about games and have meaningful conversations with my kids, their friends, and nephew about what games they like, which they’re looking forward to coming out, etc. Gaming is my outlet, as well as date night for my hubby and me! We have rules that are age-specific and don’t allow game systems (or TVs period, for that matter,) in the kids’ bedrooms. I want to know what my kids are up to, and get can’t pull the wool over my eyes because I KNOW gaming, and I am present when they are. (So is my husband. I need to give him credit, too!) We have rules about online play and they know consequences for disobeying those rules. Bottom line-gaming is great as a family activity, to blow off steam, to connect with others, and so much more. Thank you for being objective and informative! Bingo Rachel, and I too would like to thank Dr Kowert for her straightforward answers to some at times fraught questions.